Ministry of Propaganda - 27/Mar/2004: "Will they be supersized?" Oh, the irony: McDonalds is planning a clothing range for kids. Will it be supersized or won't that be necessary? 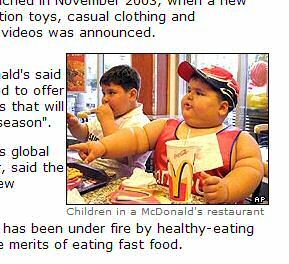 The picture the BBC included with the report is just amazing, an obese kid with a supersized meal in front of him. It will be interesting to see which sizes McDonald will offer for the clothes. And if they will ask "Do you want fries with that shirt?" Apparently it's all about a new image and direction for McDonalds. Well, I believe it when I see it. 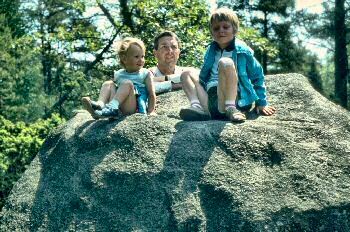 Two normal sized kids, a normal sized dad and a supersized stone.